At the beginning of November, Claudia and I were excited to go on a backpacking trip into the Grand Canyon, which neither of us has seen before. It was a great introduction to walk down all the way down into the heart of it, and WOW, we were impressed! Our loop route took us down from Monument Point on the North Rim, down the Bill Hall Trail, over the Esplanade, across Surprise Valley, down into Tapeats Creek, along the Colorado River, up the Deer Creek Trail, then back up to the top again. All in all, more then 5,000 feet of elevation drop, and then back up again! 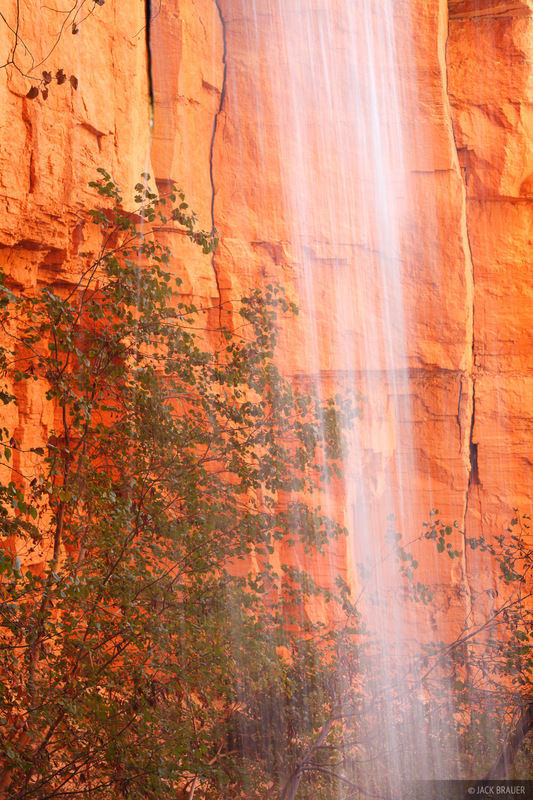 Along the way we saw some of the most incredible sights, springs, and waterfalls we’ve ever seen in the desert. 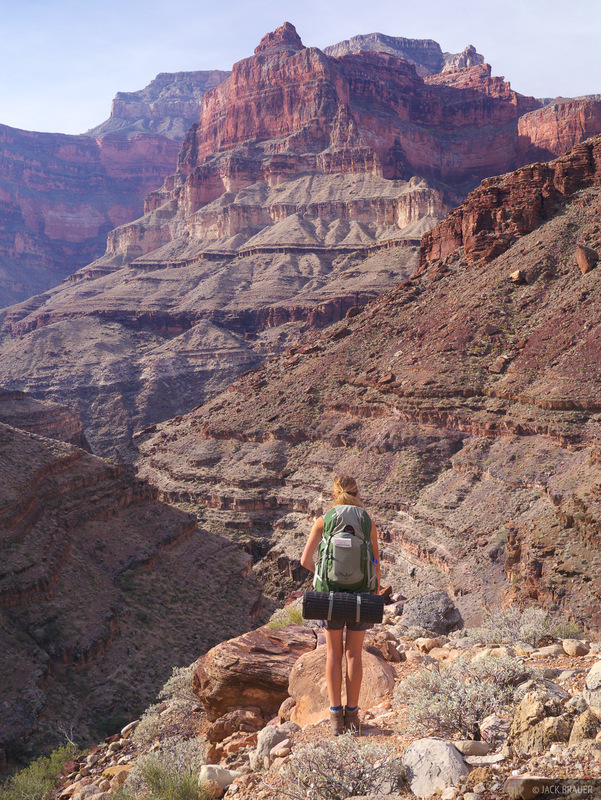 Claudia gazes into the Tapeats Creek canyon, a side canyon of the Grand Canyon. We got a late start on the first day and our hurried 4,000 vertical foot descent into Tapeats Creek before nightfall more or less wrecked my quad muscles, and left me sore as hell for the remainder of the trip. Next time I hike into the Grand Canyon I will be sure to start earlier, take my time, and rest my legs along the way. Anyhow, the views were absolutely spectacular during pretty much the entire trek and helped me forget my aching legs. There’s an unmarked trail along the Colorado River that connects Tapeats Creek and Deer Creek, allowing for a nice loop trek. Near the river we met some people who were in the midst of a rafting trip through the Grand; they certainly seemed quite mellow and relaxed after 15 days on the river. I realized more than ever that rafting through there would be the trip of a lifetime! 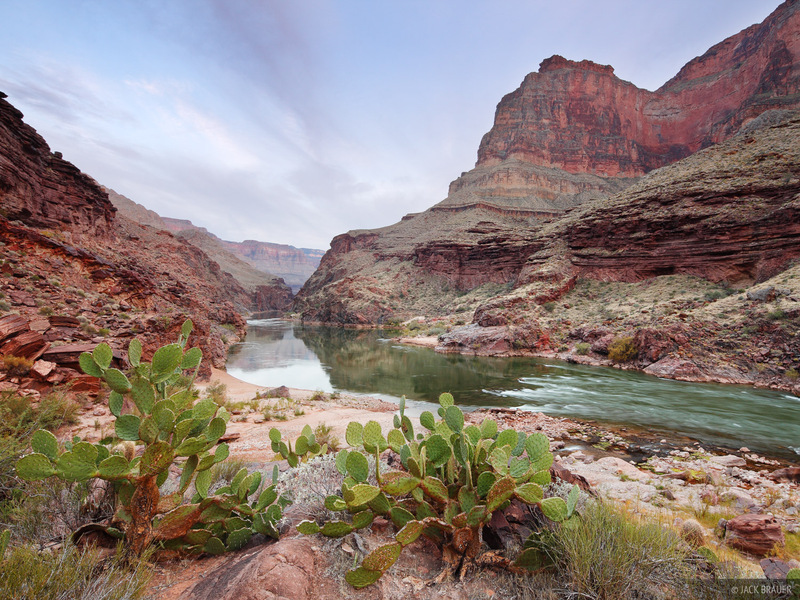 A pleasant desert scene along the Colorado River in the bottom of the Grand Canyon near Deer Creek. Long exposure image of the waterfall that pours out from Deer Spring. 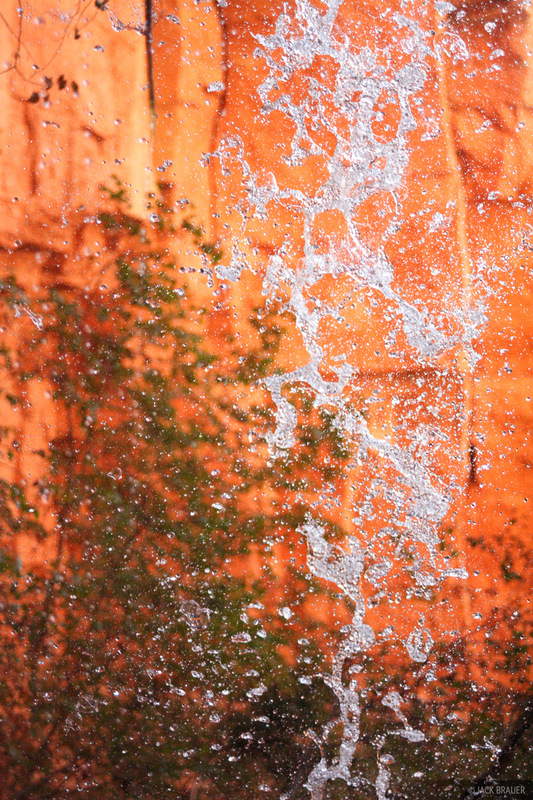 A fast shutter speed captures the waterfall that pours out from Deer Spring. On our third and final day, after a night at the Deer Creek campsite, we took showers in the Deer Spring waterfall and chilled out in the “thrones” for a few hours [you’ll know what these are if you’ve been there!] before reluctantly shouldering our packs again to continue the 5,000 vertical foot slog back up to the North Rim. Hiking out of Deer Creek. Even in November the afternoon sun was quite hot, and we made sure to fill up with extra water for the long dry hike up. There’s simply no way you could do this trail in the summer, unless you’re a real masochist. Sunset in the Grand Canyon, as seen from the Esplanade below Monument Point - November. Because of our late morning start and our relaxed delay at Deer Springs, the sun set while we were on the Esplanade about 2/3 of the way up. No matter, we just hiked the rest in the twilight and eventually in the dark via headlamp. Probably that was better anyways, rather than doing the whole thing in the afternoon heat. 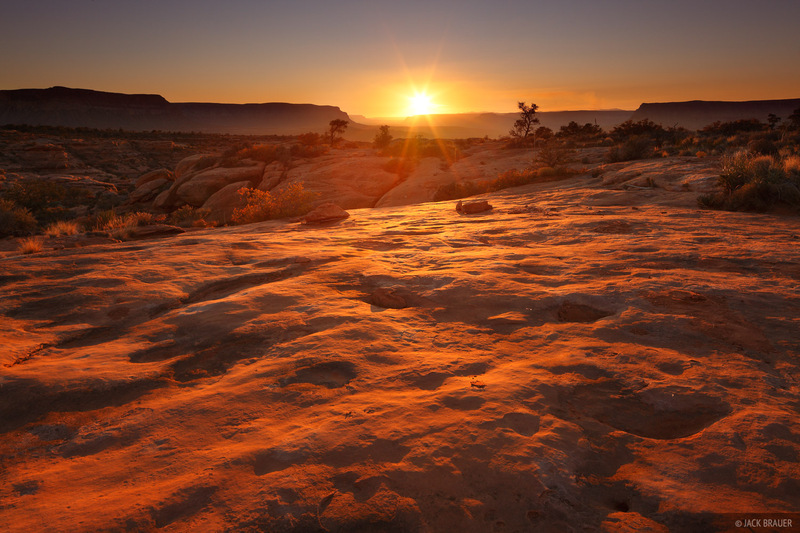 All in all, this was an instant-classic trek – one the best desert hikes I’ve yet done. We were deeply impressed with the Grand Canyon, to say the least. One regret was that we couldn’t stay longer (because of limited permit availability); I could have easily spent four nights down in there instead of just two. With two nights it felt like we were hiking most of the time and not relaxing as much as I’d have preferred. In any case, I’m sure we’ll be back again. 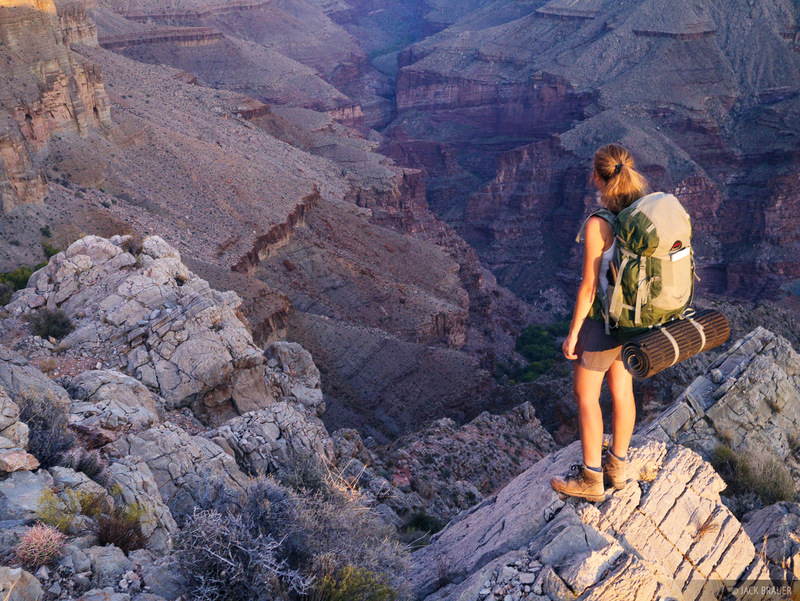 Posted in Backpacking & Trekking, Canyons & Deserts and tagged Grand Canyon, Arizona.